THE GREMMIE SURF FLY For Sale! An all round surf fly that casts easily in the wind, the Gremmie drops quickly through the currents and into the feeding zone. The pulsating red marabou and crystal flash is a consistent fish finder. The hook swims upside down, Clouser style, to prevent snags. It imitates shrimp, the pelagic red crab, and the bloodworm. Fish the Gremmie with straight casts and short, firm strips on a 200 to 300 grain head or sink tip. There is no equal for barred surf perch, yellow finned croaker and calico bass. It has taken two dozen species of salt water fish in southern California and Baja. Hook – Mustad 3407, sizes 2 to 6, sharpen it! Tail – Three strands of Pearl Krystal Flash under a clump of red marabou tips. Abdomen – Two turns of orange yarn. Eyes – 7/32 brass or black dumbbell, tied on top of the shank about one third of the way back from the hook eye. Wing – Red marabou tips slightly shorter than the tail, tied on directly behind the eyes with butts tied down over the “handle” of the dumbbell. Lateral line – Two strands of Silver Krystal Flash tied in front of the eyes to lie along each side of the hook shank. Throat – 1/8 inch clump of deer hair died red (or red Ocean Hair), tied in directly behind the hook eye and extending just past the hook bend. 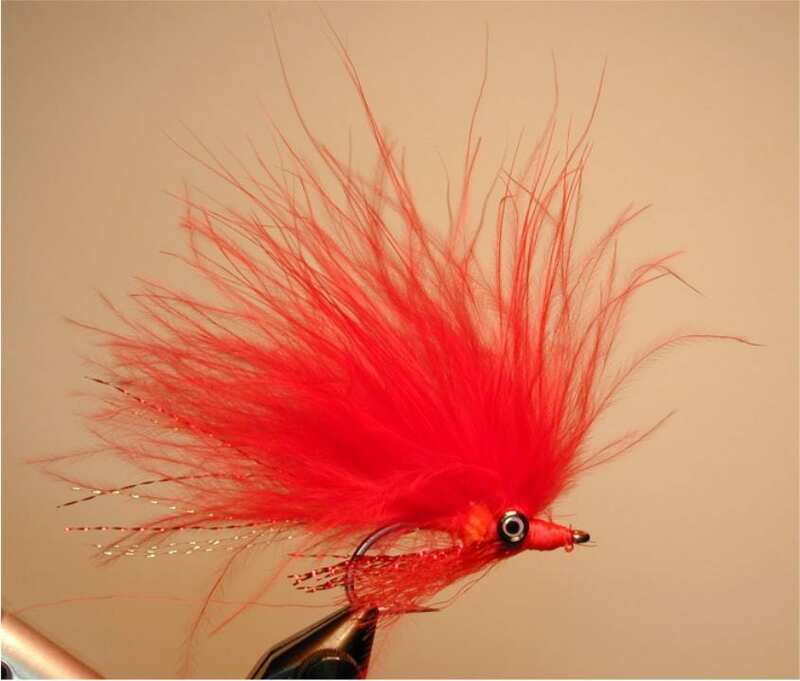 Topping – Red marabou feather tip tied as a cockscomb to stand forward of the dumb bell eyes, its length such that when wet and folded back it is shorter than the wing tied in behind the eyes. Note: One cross wrap back over the dumbbell helps tilt the feather into the correct, slightly back from right angle position. Glue and knot the thread at every step. To prevent rust on salt water flies, rinse them in fresh water after use.